Say Hello to Fisher & Paykel – Our New Washer! Fewer moving parts. Top loading high efficiency. GREAT price. This machine usually sells for around $900 but Don and I put in a marathon clearance shopping trip to Lowes and Nebraska Furniture Mart last night. 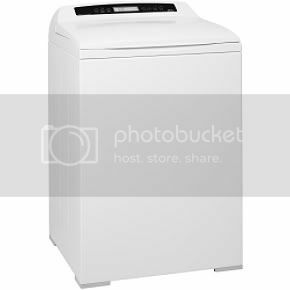 It was next to a brand new Whirlpool Duet high efficiency front loader in a discontinued color of shimmery brown (normally about $1,000 but for sale at $550). The Fisher & Paykel was marked down because it had been returned. The Whirlpool was new but the color was discontinued. After talking to the service people there, we had actually decided to NOT get a high efficiency machine until after we moved because they can be difficult to move and expensive to fix. We were looking for something really cheap to get us through then after we moved, I could use the machine to felt and we would replace it with a new high efficiency set in Houston. Well, the price of this thing convinced us. Fisher & Paykel warranty it for TWO years (Whirlpool only offers one year) and then we splurged for the 4 year Lowe’s plan that starts AFTER the 2 years are up – so our washer is covered for 6 years. We had a 10% coupon, too, so this is how the deal went down: $324 washer plus $59 delivery fee (we wanted them to take away our old one) plus $26.81 tax = $409.81 for TOTAL washer, delivery, takeaway. Add the other $99 for the policy and we spent just a bit over $500 for our new high efficiency washer. I’m so excited to have a top loader because a) I don’t have to bend and b) I don’t have to buy a podium/stand and c) they are much sturdier and more reliable than the front loaders and d) better for felting. What convinced us is that we saw the same exact machine at NFM for $900 that very night. It was a difficult choice. The shimmery brown Whirlpool was pretty but it wouldn’t match my already white, working-perfectly dryer. So that sealed the deal. I can’t wait to try out all of its features. You can check out the machine and capabilities here and here – then you will KNOW we got a smokin’ deal. ← Tribute to Cole – He’s 13 Today!